There is nothing like a tart, crisp apple. I love apples and autumn and all the comforts that come along with it: hot apple cider, apple pies and those rare days of crisp autumn weather. Thankfully, this past weekend was all about the blue skies, sunshine and that crisp autumm air…and it was also the UBC Apple Festival! I’ve written about my apple extravaganza weekend for the Food Network blog (which should appear next week or so), but needless to say an apple festival is a pretty wonderful thing. Besides a whole lot of apple tasting and a bit of candy apple eating, I also came home with some BC-grown goodness: one bag of Jonamacs and one bag of organic Newtown Pippins. While the pippins are pretty good eating as is, I’m not too fond of the Jonamac’s not-so-crisp texture. In my eyes, it’s an apple destined for something more. Yesterday I was in a baking mood. I was leaning towards a crumble or a cake, but as it was still morning, I figured something more wholesome and breakfast-friendly would be more suitable. This quick bread is really easy to make even when you haven’t filled your coffee quota for the day. I shared a slice with Cornelius shortly after it came out of the oven and I wasn’t swayed…the bread was very apple-y, very dense and a bit too moist for my liking. So once it fully cooled (and after Cornelius grabbed a second slice of his very own), I put it in the fridge and promptly forgot about it. Until this morning, that is. After I poured myself a cup of coffee, I started rooting around the fridge for breakfast and stumbled upon yesterday’s baking experiment. I gave it another shot and was glad that I did. 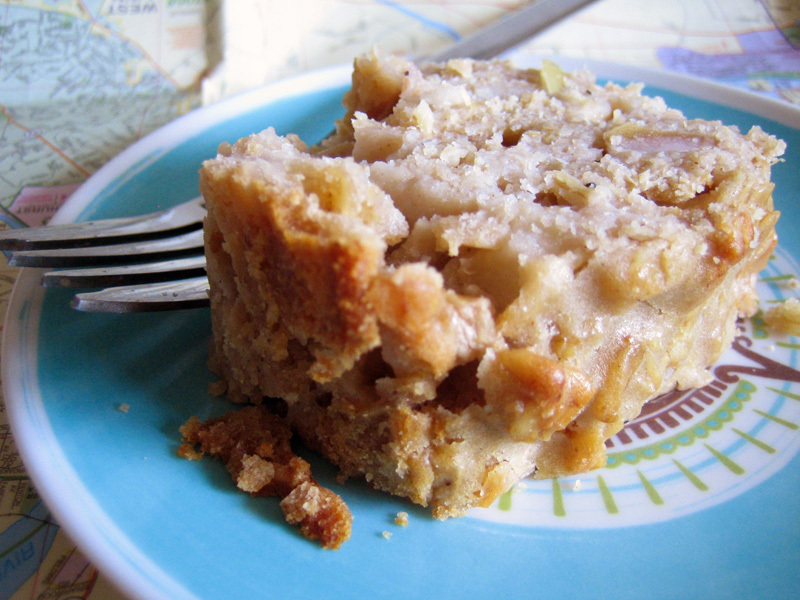 Yes, it’s still very dense and apple-y, but it really works for breakfast. 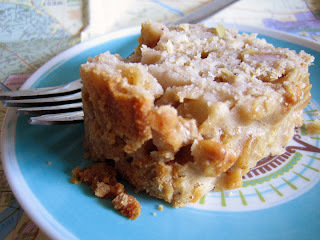 It’s hearty and filling and has a very lovely chai flavour that compliments that apple goodness. It may not be something you want to share with company, but who wants to share anyway. 1. Preheat oven to 350. Mix together the first 7 ingredients in a medium sized bowl. In a separate bowl, combine the milk, honey, oil and egg until well blended. Add the dry ingredients to the wet and stir until just combined. Fold in the diced apples. 2. Dump the batter into a well-greased loaf pan and bake for 45-50 minutes or until the top gets golden and a knife inserted into the centre comes out clean. Cool. Glad to see you are back! Looking forward to reading about your adventures. I just visited an orchard this weekend and was Apple heaven. I will use some of my “bushel” to try this recipe! Great by themselves but together? Sounds so yummy I have to try this out myself! I’m heading to St. Jacobs this Saturday for some farmers market splendor. I’m sure that we’ll be bringing home some apples cause the husband loves his fix! Oh I heard about the apple festival but then totally forgot about it. I must make a mental note to go next year. Oh chai spice with the apples sounds really good! what a lovely quickbread you’ve made, to incorporate the apples!! caroline, as tasty as this bread is, i don’t think it can beat that cake recipe you posted! yummers. maria, chai and apples are a pretty wonderful combo! joanne, st. jacob’s sounds so nice! i’ve never been! if they have any belle de boskoop apples, snap them up! eatmedelicious, yes, go to the apple fest next year! and do your research cuz all the great apples sell out early! joey, chai flavours go so well with apples…and pumpkins too! perfect fall foods. i agree that autumn rocks too, veggiegirl! so many delicious apples to try! i made this the other day and you’re right, hot out of the pan it’s a little mushy, but boy howdy did it ever make a great breakfast. tarah, let me know if you do! rach, i’m glad you liked it. it’s true, it does need some “mellowing out” time, but it sure makes a great breakfast once it’s cooled. i think i will have to make this today. it will go great with rain and grey skys. i made this last night but as big muffins, and it made the best breakfast! i used kamut flour and maple syrup because i had no honey, and they turned out perfectly. i think i’ll be making these as least once a week for a long time to come. thanks for the recipe! I just baked this to have for breakfast tomorrow. I did 1/2 cup of whole wheat flour and 1/2 cup all purpose flour to try and make it a little more weighty. I made this for the kids and they LOVE it, thank you! This may sound a little naïve so I will apologize in advance, but this is the first recipe that has not used chai tea bags to develop the flavor. Is it just the addition of the cardamom or does it also include the cloves and nutmeg too? I have those spices on hand at all times, so I would much prefer to go this method than buying tea bags. Btw, I just discovered your blog and started copying the recipes. Needless to say, I had to do a trip to the dollar store for a notebook! ;-). Congrats, it is a beautiful blog. Hi Jenn, I really think the cardamom is what gives this a true chai spice flavour. 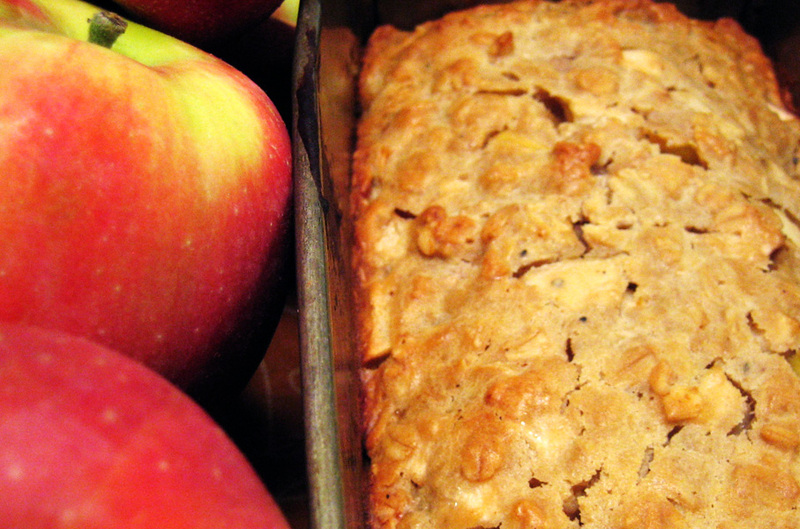 Without it, it would just be a more “apple pie” spiced loaf. Enjoy!